Heavy Rains Saturday (August 4, 2018) On West Slopes Of The Sacramento Mountains. Blog Updated At 4:15 PM MDT Monday, August 6th, 2018. Looking West At Wimpy Looking Thunderstorm Anvils North Of Dunken. But A Closer Look Reveals The Moon. Minor Flooding On US Hwy 82 Near High Rolls. Bar Ditch Flooding. Mud And Small Rocks Being Washed Over The Highway. Heavy Rain Was Creating Waterfalls On The Sides Of The Rock Bluffs. Looking South From US Hwy 70 Just West Of Mescalero. 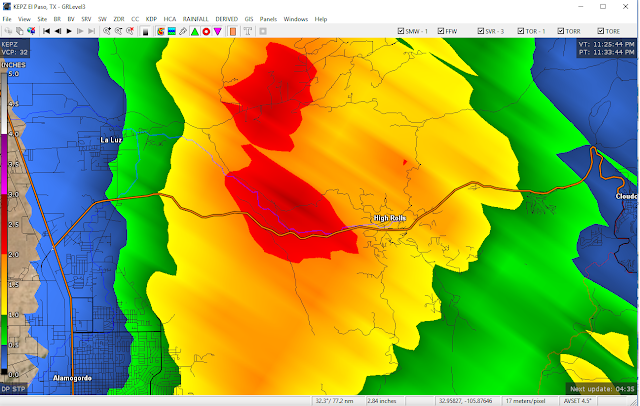 GRLevel3 Radar Estimated Storm Total Rainfall Amounts. (NWS El Paso/Santa Teresa Doppler Radar). Thunderstorms dumped heavy rains on the west slopes of the Sacramento Mountains Saturday afternoon. 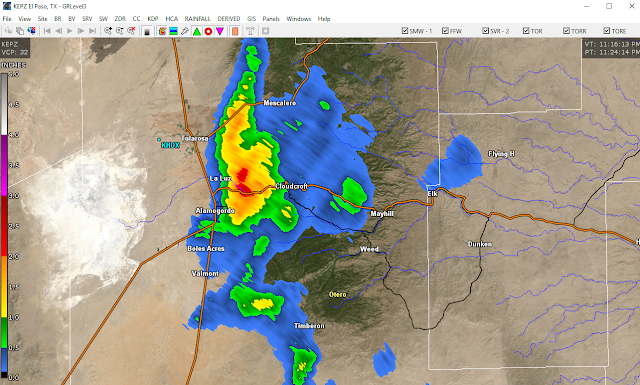 The El Paso/Santa Teresa Doppler Radar estimated that as much as 2.80" may have fallen in a little over an hour west and northwest of High Rolls. 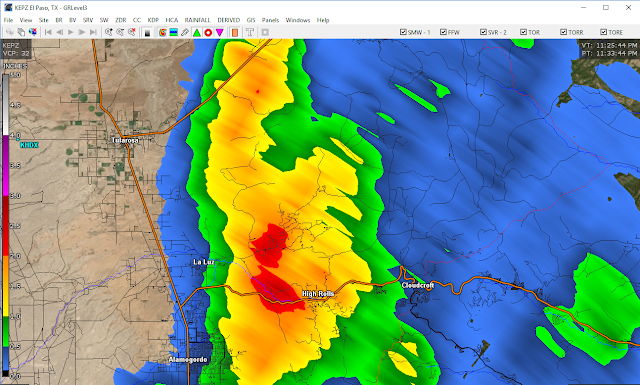 This is the same thunderstorm that we ran into coming west out of Cloudcroft down US Highway 82. Aka the photos I took above. Larry Carson shot the video below near La Luz of a normally dry arroyo that was undergoing flash flooding from these heavy rains a little while later and west of where the heaviest rains fell. 1.50" of rain was reported to have fallen in High Rolls Saturday afternoon from this storm. NWS Radar Estimated Rainfall Totals. (And Reported 12-Hour Rainfall Totals As Of Midnight Saturday Night). Flash Flooding Of A Normally Dry Arroyo Near La Luz. Courtesy Of Larry G. Carson II - Saturday, August 4th, 2018. 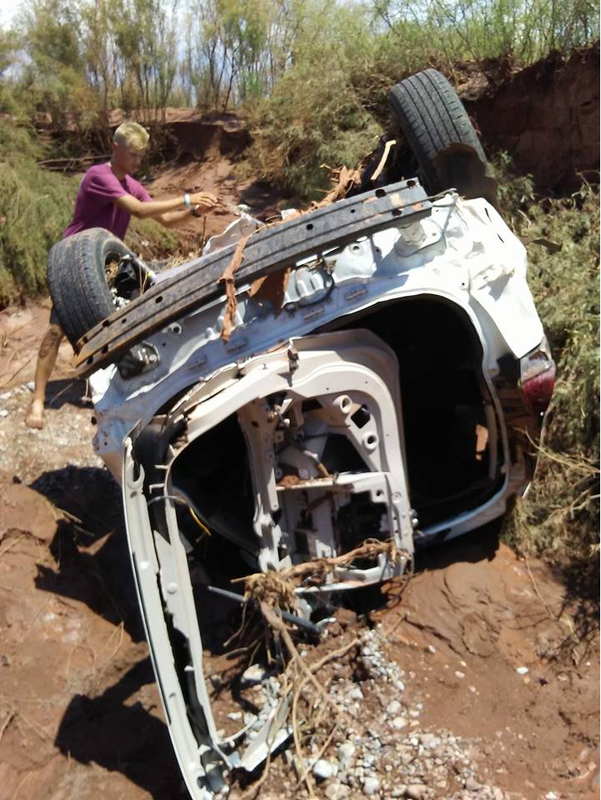 Vehicle Swept Away On Rita Rd Near La Luz, NM. Videos/Photos Courtesy Of Becca Baily Of Tularosa, NM. 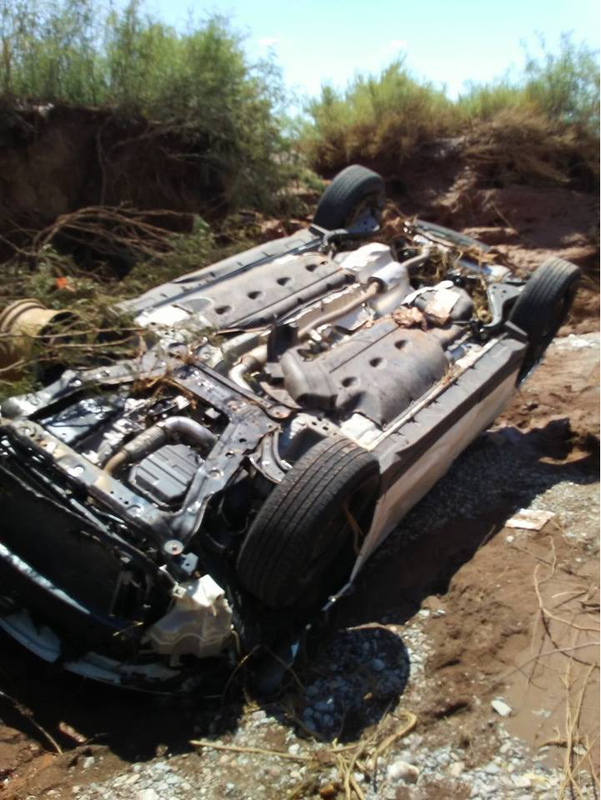 Flash flooding in New Mexico is a huge concern most years. 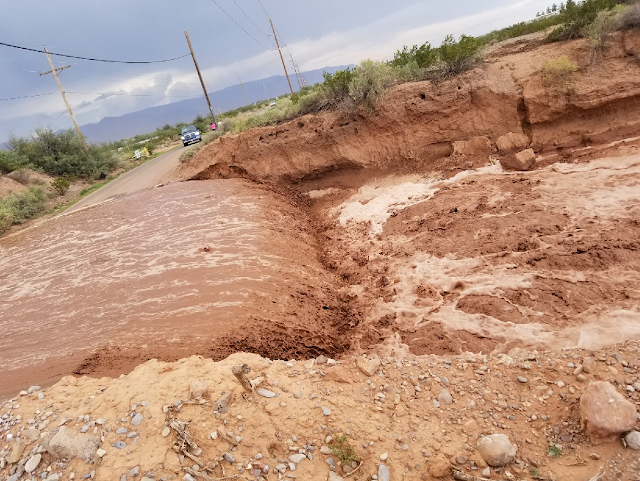 Normally dry arroyos such as this one depicted in the videos above near the High Rolls, La Luz areas of Otero County can flood within minutes after heavy thunderstorm rains. Such was the case the past Saturday. Thunderstorms over and near the Mountain Park/High Rolls areas along the west slopes of the Sacramento Mountains dumped an estimated 1" to nearly 3" of rain in about an hour and a half. This was the result of those sudden heavy rains over rocky mountainous terrain. According to Becca Bailey's Facebook post the driver made it out alive just before his car was swept away. The flooding and heavy rains my wife and I observed near the High Rolls area (photos above) was a precursor to this flash flooding.